From small books to large, this time we have an item from the oversize section in our special collections, Edward Quin’s Historical Atlas. This book was published in 1830, two years after the author’s death, and continued to be published in various forms for about thirty years. It was reprinted in 1836, then in 1846 William Hughes (1818-1876) redrew the maps and published them separately from the text. 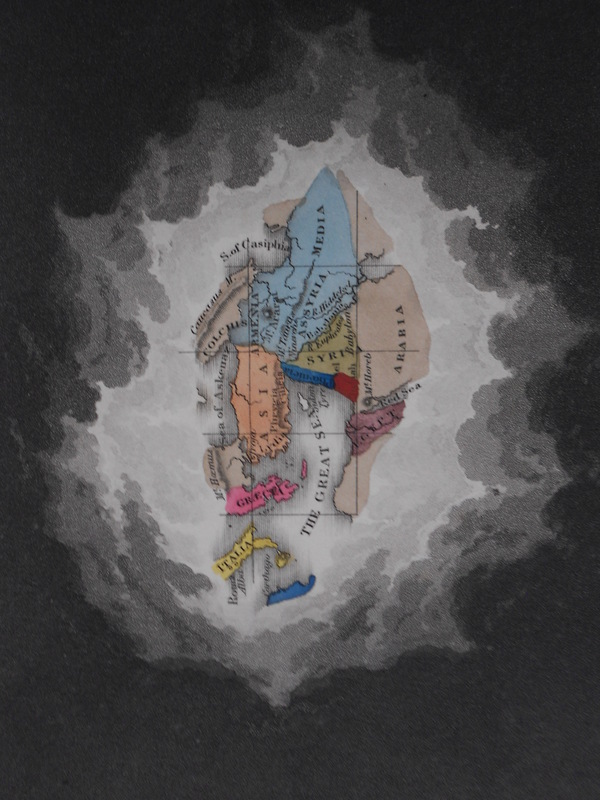 The original work was also highly influential to Emma Willard (1787-1870) who published the Atlas to Accompany a System of Universal History which contains maps very similar to those of Quin. 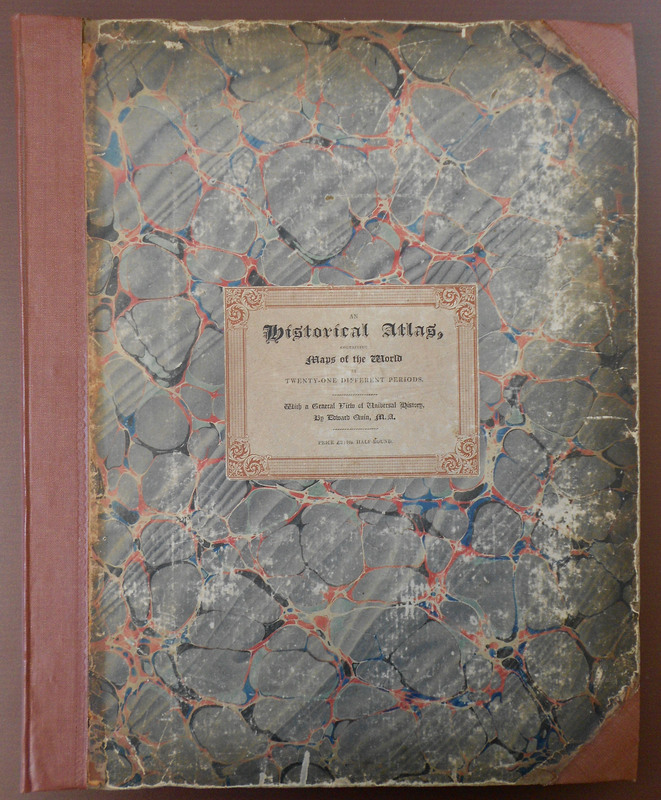 Examples of Willard’s maps can be seen here, and the only images of Hughes’ that I can find are here. The Historical Atlas contains text and maps ranging from The Deluge (B.C. 2348) to 1828, when the book was completed. Its preface states that the plan was to produce a “known history of the world as a whole…. as a consistent and uniform whole”. Quin achieved this by using the same scale for all of the maps and by placing each country in the same place in each. The text itself is a bit dull, it explains who ruled which empire/country, for how long, and who succeeded them. In some cases it gives an idea of a person’s character, for example Charlemagne’s son Louis the Debonair (also known as the Fair or Pius) was “of an imbecile and pusillanimous character”. There are also a few mistakes in the book, either by the author or the printing process I’m not sure. For example on page 23 it refers to the Emperor Adrian as the builder of the wall running from the Solway of Firth to the mouth of the Tyne. Each map is colour coded to distinguish the different empires: colours used include crimson, lilac, shades of blue, shades of green, the more exotic pink grey and chocolate. In most cases a colour was used repeatedly for the same empire, but sometimes the colour was used for different empires. For example pink was used for Scotland in the 13th period but after it became part of the British empire it is used for the United States of America. Described by a reviewer as “novel” and “ingenious”, the clouds add a new dimension to the Atlas that hadn’t been seen before. Goffart refers to the use of clouds as Quin’s “highly personal device combining function with decoration, make him a memorable cartographer”. Both Black and Gottart believe that the clouds represent growth of knowledge of the earth and the discovery of new countries rather than the progress of civilisation. The clouds vary slightly in their billowing and shading, with more movement as the years progressed. In most cases the Atlas seems to have been well received. One reviewer however, did not like that the Garden of Eden was placed in Mesopotamia, calling it a “gross geographical blunder”. The reviewer, however, does go on to say that the book would be useful not just to the general reader but also to teachers and students. More photos from this colourful book can be seen below. Exhibiting The Empire Of Kublai Khan.